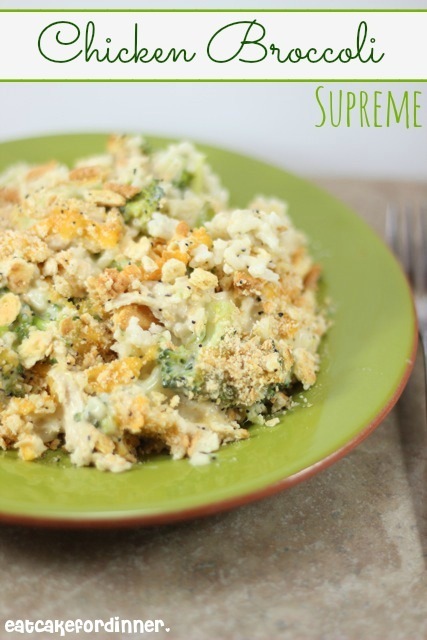 It's been awhile since I posted a chicken, broccoli and rice casserole recipe. This one is different because it has poppy seeds in it and since Ritz crackers make everything better, I crushed them up and sprinkled them on top instead of the same-old bread crumb. Crushed Ritz crackers not only add a rich and buttery flavor, but they give the casserole a nice soft crunch in each bite. 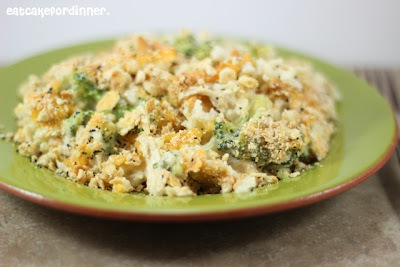 So so good when mixed with the creamy sauce, melty cheese and crisp broccoli. Preheat oven to 350 degrees. For the sauce: In a large saucepan over medium heat, melt the butter. Whisk in the flour, one Tablespoon at a time, until a thick paste forms. Cook for a few minutes. Gradually add the chicken broth, whisking constantly to prevent lumps from forming. Gradually whisk in the milk and the half-and-half. Season with salt, pepper, onion powder, garlic powder and lemon pepper. Continue cooking over medium heat until thickens and reaches a good creamy sauce consistency. Taste and add more seasonings, if needed. Whisk in 3/4 cup of grated Cheddar cheese and stir until melted. Layer the steamed broccoli, cooked chicken and cooked rice in a greased 9x13-inch baking dish. Pour sauce over the top. Sprinkle with 1/2 cup of shredded Cheddar cheese. Jenn's Notes: Instead of mixing my crushed crackers with melted butter, I sprayed them lightly with butter spray to save a few calories. I figured most people won't have butter spray, so I included melted butter in the recipe instead. Looks like the only way to eat broccoli! Yummy. Wow, another broccoli recipe that i love to try, Looks delicious. Thank you! Mmm, this looks yummy. I am going to try this next week. I LOVE THIS RECIPE!!!!!!!! It's great for a low sodium diet.